This Gothic brick church in downtown Hartsville was built in 1913; however, the congregation was organized in 1858 in an area called Center Point due to its location at the center of the intersection of two main roads. This area is thought to be somewhere near West Carolina Avenue and Kelleytown Road. Not yet granted church status, the small congregation was initially referred to as the Center Point Mission. The Presbyterian congregation finally attained church status in 1867 following the Civil War, and the congregation built a frame church structure by 1871. Center Point Church, as the church was chartered, began to grow from this point. 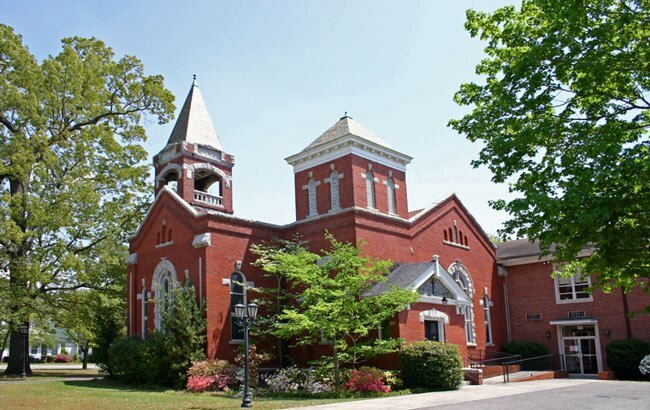 Sometime shortly after Hartsville was established in 1891 following the laying of railroad tracks in 1889, the frame building was moved to the church’s current location. Following this move the church changed its name to Hartsville Presbyterian, and later it would be changed again to First Presbyterian of Hartsville. By 1910 the congregation was ready for a larger, more modern sanctuary. Over the next two years enough funds were raised to construct the brick church that now stands in place of the 1871 wooden church. The wooden frame church was then sold and moved yet again for use as a warehouse before being disassembled. The present brick church is fortified with granite trim and a slate roof. The congregation remains active in the Hartsville community and belongs to New Harmony Presbytery. The following article was contributed to the South Carolina Picture Project by Bill Segars of Hartsville. It originally appeared in his local paper, The Darlington News & Press, where it was published in September of 2015. One of my goals in writing about church buildings is to show readers that there is typically much more to a church building than the brick and mortar or wood that we see as we ride by it. It has an interesting history. Sometimes that history pertains to its founders and or members, sometimes it pertains to its building techniques, sometimes it pertains to its survival skills. Together these historical facts mold the structure and its congregation into what we very often today take for granted. Without knowledge of these historical facts, we assume that the church “has always been here.” More times than not, this is not the case. The church building that we see today located at 213 West Home Avenue in Hartsville has not “always been here.” As a matter of fact, it has not always been known as First Presbyterian Church. Its 1867 establishment date did not even occur at this location. Hartsville had settlement roots in 1845 when John Lide Hart bought 495 acres of land in the area. The town of Hartsville was not established until 1891, shortly after a rail line was built into the area in 1889 by Major James Lide Coker. Without many people here, there was not much need for a church. A few Presbyterians with names like Law, Cannon, Harrington, Kelly, and McKinnon felt the need for a Presbyterian Church in the area, so they started one in the most densely populated area of the region. At this time this area was about four miles west of the present downtown Hartsville area between the Kelleytown community and the Thomas Hart Plantation, later known as Kalmia Gardens. This area was known as “Center Point” because of the “Y”-type intersection of two dirt roads. The exact location of the first building for this congregation is not known, but it is assumed to be close to the present day intersection of West Carolina Avenue and Kelleytown Road. These early Presbyterian must have been very diplomatic. They wanted to start their own church, but they had no desire to offend any of the existing neighbors. In October of 1858, as a reason to establish a church in the area, the early records of the Center Point Mission say “not to rival the Baptists in the area, but as a home mission undertaking in the Kelleytown area, a thickly populated but ignorant and irreligious community.” So this began the Center Point Mission. Like most start-up churches of this time, additional membership, other than the founding members and their families, were hard to come by. Services were held very sporadically, every other week at best. So the small group struggled to survive. Then three years later, the War between the States began, taking many of the local men away. By the end of the war in 1865 and Union Major General John E. Smith’s march through the area, the mission was all but abandoned. The 14 remaining members were not to be denied a place to worship, so in October of 1867 they petitioned the Presbytery for status as Center Point Church. Colonel Thomas C. Law’s son, the Reverend Thomas H. Law, would not let his father’s dream of establishing a Presbyterian church in the area fail. Even though very few original members remained of the Center Point Mission, 12 local people gave $130 towards the construction of a new building. A new wood frame building was built and dedicated on January 22, 1871 as Center Point Presbyterian Church. Prosperous times were ahead, the church began to grow. Music proved to be a vital part of Center Point’s growth due to the fact that they were the only church in the area to have a musical instrument. Written church records are vague on the next monumental “move” for Center Point Church. Sometime between 1889 and 1893 the Center Point building was physically moved to the present corner of West Home Avenue and North Sixth Street in Hartsville. At the time of this move the name was changed to Hartsville Presbyterian Church. The new Hartsville community was beginning to grow, surpassing the population of the rural Kelleytown area. The Reverend T.F. 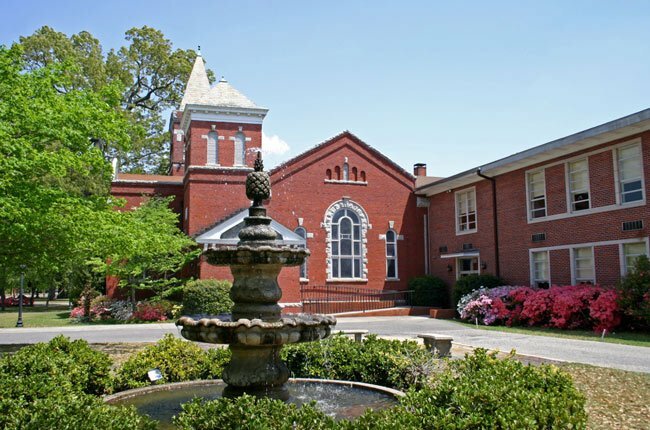 Haney came to Hartsville in December of 1909 to usher the church into the congregation and the building that is known today as First Presbyterian. The Reverend Haney showed the young congregation the importance of order in services and the benefits of supporting the church that they loved through their monetary contributions. The true value of Haney’s leadership was put into action on October 11, 1910 when the church Session voted to build a new house of worship. The process moved extremely quickly with a vote of approval by the full membership on the 16th, and on the 23rd of October a Canvassing Committee reported that $12,000 to $13,000 had been subscribed. Continuing the quick pace, plans drawn by Henry E. Bonitz were shown to the congregation and sent out to builders for bids. On July 11, 1911 the bids were opened and deemed to be too high, or at least more than the congregation could afford. In order to keep the momentum moving, the Building Committee “employed Mr. J.E. Stack to superintend the work by the day”. After the 1871 wood frame building was moved to the back corner of the lot for continued use, construction of the Gothic Revival building began. Its solid 8″ thick brick walls went up quickly, but available money slowed the construction process. Realizing the importance of music, even without enough money in hand to pay for the building, the congregation vote to install an organ along with construction of their new building. The building was completed and ready for its first service on March 16, 1913. What happened to the original 1871 wood frame building? After its use during construction of the new church building it was sold to A.M. McNair and moved to the southwest corner of Carolina Avenue and Sixth Street, where it was used as a warehouse. After that life it was disassembled and its lumber used to build a tenant house in the Sand Hills. On a personal note for my friends at First Presbyterian, many of those “ignorant and irreligious” folks in the Kelleytown Community are my ancestors. I hope that you will agree that time has brought about improvements.